The work of PACCC benefits greatly from the financial support of numerous local individuals and organizations. PACCC is recognized by the Internal Revenue Service as a 501(c)(3) non-profit organization. All donations to the agency are tax-deductible to the extent allowed by law. There is a vast need for safe, affordable, high quality child care for all families living in the Mid-Peninsula region, including our neighbors with low incomes. 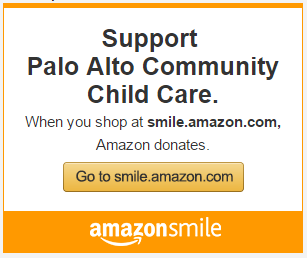 In an effort to address this need, PACCC operates the Family Partnership Program, which leverages funding from the City of Palo Alto, the State of California (in partnership with the Palo Alto Unified School District) and its own fundraising efforts to provide high quality early childhood programs for qualifying families. Donations may be made either to support the Family Partnership Program, or to benefit a particular PACCC child care center. Tax-deductible gifts may be in the form of a check made payable to PACCC, or by using PayPal to donate by credit card or online bank account. PACCC is a charitable organization pursuant to Section 501(c)(3) of the Internal Revenue Code. PACCC welcomes gifts of stock, a form of giving that offers significant advantages both to the donor and to the agency. PACCC's non-profit status means that you will not have to pay capital gains tax on stock that has appreciated over the years. For further information, please contact: Dicie Hinaga, Chief Financial Officer, at (650) 493-2361 ext 13, or e-mail her at dhinaga@paccc.org. PACCC welcomes the opportunity to discuss with you the additional tax advantages of making a planned gift, such as a bequest or a trust. Such thoughtful and far-sighted acts of generosity have the power to support the agency's work on behalf of young children and their families for many years to come. We strive to develop consistent and mutually beneficial partnerships with volunteers from all areas of the community. By joining as a volunteer you are making the commitment to assist and support center staff through various activities and tasks. Our 19 child care centers benefit from your unique talents, expertise, wisdom, and love of play! Volunteers are required to receive a TB test and provide proof of influenza, pertussis and measles vaccinations. Submit proof of TB Test. Submit immunization records for influenza, pertussis (whooping cough) and measles vaccinations. More information on required vaccinations here. Consent to a background check and reference check. If under the age of 18, you will need your parent to email or fax a signed consent form. Acceptance of volunteers is contingent upon meeting the above requirements and the needs of the centers. Completing an application does not guarantee acceptance into the volunteer program. For questions please contact Beatriz Pastor at bpastor@paccc.org or by calling (650) 493-3113.